**** you, mother******, Anarch for life! 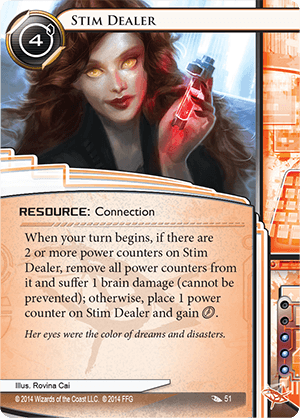 I love playing anarch in Netrunner, which partially explains the subject matter of my latest PopMatters piece. Anarch was the first runner faction I fell in love with, Noise in particular. I come from a heavy Magic the Gathering backround and my favorite decks were always weird. From control hijinks to graveyard manipulation shenanigans, I love cards that upset the norm. The anarch faction is designed precisely to keep the corporation guessing. I touch a little upon MAXX in this write up, but I want to spend a second here to expound on her play. At the beginning of the runner turn, MAXX trashes the top two cards of her own deck and draws one card for free. Drawing a card normally costs one click, or action, so this ability over a course of the game is amazingly efficient. Unfortunately trashing two cards every turn can also be a risky maneuver. What if that program you need so badly gets tossed before you get a chance to play it? That's where recursion comes in. Like Magic, several cards let you play things directly from the runner's heap. As a result, MAXX's heap is almost like a second grip (hand), the contents of which are random. There is a beauty here, mechanically and narratively. During the course of a game, nearly every card in your deck will make an appearance. Piloting MAXX is all about managing the chaos of the game and exploiting her efficiency with a fiery aggression. It is a heightened version of a process you already engage with through play. 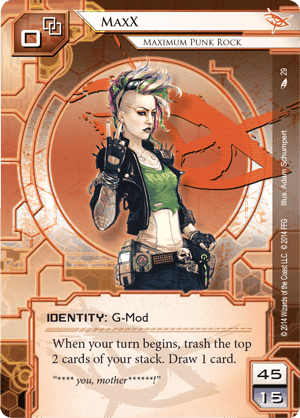 Additionally, the concept of a runner embracing the dangers of the hacker lifestyle fits wonderfully with Netrunner lore and even the politics of anarchism. Edward Kim, fighting for human rights, might contact a Stim Dealer and induce brain damage, all to fight corporate tyranny. Alternatively, a Shaper might do the same thing just for fun.